Now and then, I receive frantic calls for jobs that are described as “painting emergencies.” Once I’ve hung up the phone and stopped laughing, I head over to the apartment where the crisis is taking place, and usually find a small piece of damage that sticks out like a sore thumb. It’s my job to paint it into invisibility. 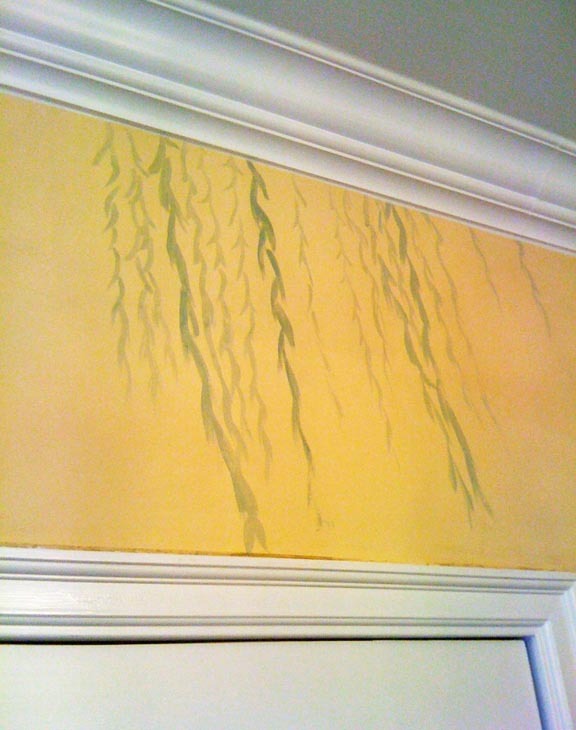 This first example is part of a full-room mural in a dining room, painted with a pretty landscape consisting of many birds and weeping willow trees. 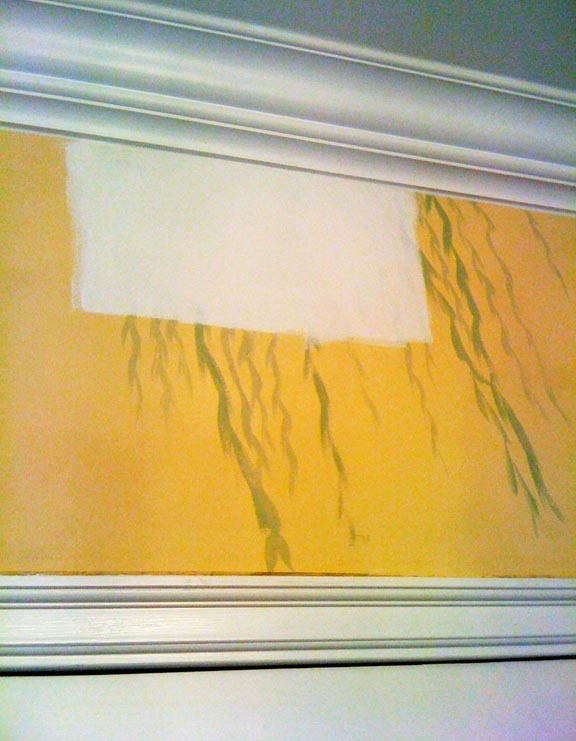 Unfortunately, water damage occurred just above the door to the kitchen, below the crown molding, ruining the design. The contractor repaired the area, then called me in. The damaged area was about 8 x 16 inches. Here’s the match. No more patch! 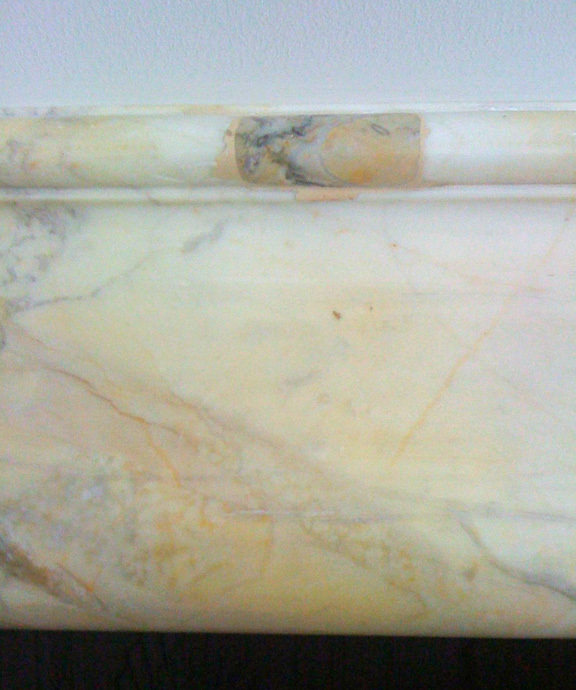 This next example is a tight photo of a beautiful marble fireplace surround. 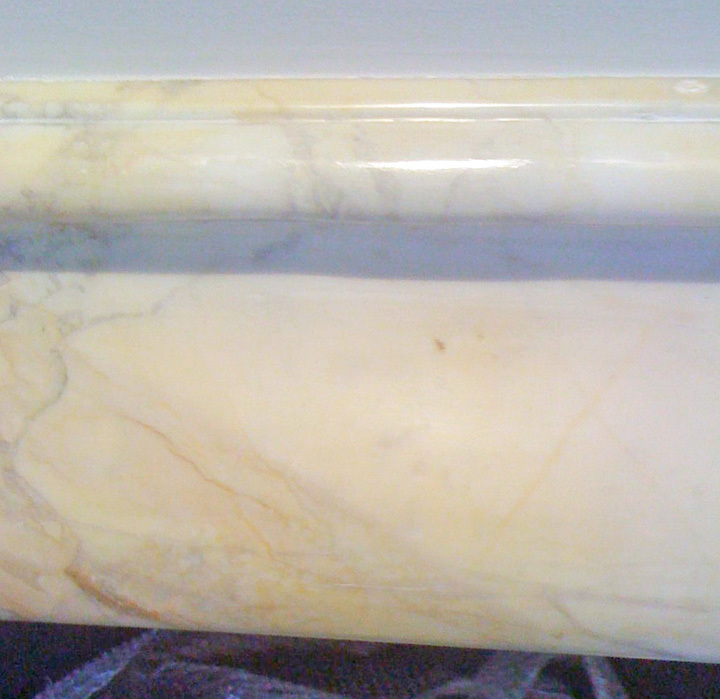 It had been damaged, and the marble man fixed it by splicing in something that didn’t match. At all. Needless to say, the homeowner wasn’t amused. The repaired area is about 1-1/2 inches long. This last example wasn’t an emergency, but was well-timed, since the apartment was on the market and scheduled to be shown to prospective buyers. I painted over several outlet covers to blend them into the surrounding wood, creating a seamless look in the living and dining rooms. If you’re spending a gazillion dollars on a New York apartment, this is a nice detail for the realtor to point out. This outlet cover was installed in the baseboard and took about an hour to paint, most of which was spent on my side, lying on the floor, using a brush with about four hairs in it. I love these little jobs; they make me feel like The Paint Doctor. The scenario is generally the same: I receive a panicked phone call and dash over to inspect the extent of the injury while the homeowner hovers anxiously over my shoulder. Then I return with my little black bag of magic tricks and tend carefully to the wound until all signs of trauma are erased. Cue sounds of joy from the client, and I’m out the door in record time, ready for my next house call. What are the odds, someday you’ll be getting a call from someone who wants you to paint over their couch potato spouse? 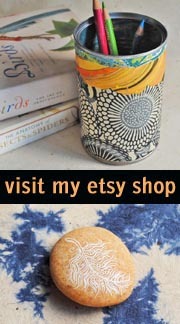 People like to ask me if I can paint away their wrinkles! I can paint a fake piece of wood, but Caravaggio is beyond me! Hello, I am an electrical contractor and we have recently installed a newer product for a customer called Trufig. 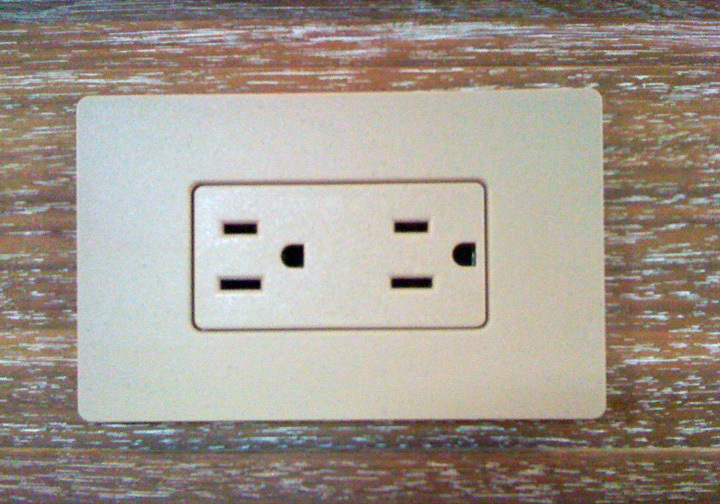 Trufig is a completely flush electrical/switch outlet that can then be faux painted to match the surrounding material i.e. wood, marble, glass, etc. My customer has a very distinct stained oak millwork “cube” feature in his new modern home and requires some very precise and accurate faux wood grain painting on two receptacles and a double switch located in the “cube” millwork. He wants the receptacles and double switch cover to completely blend in and be virtually invisible so the magnificent millwork is all that one sees. 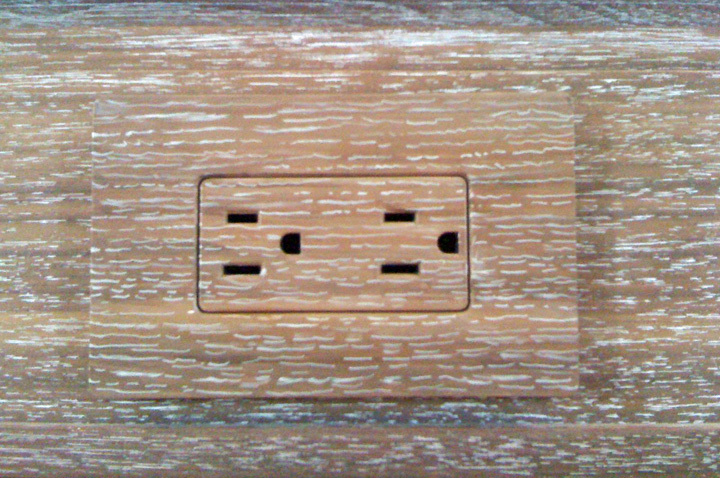 The faux painted wood grain receptacle made me think that you could do the job for our customer. The house is in Vancouver, BC. Are you relatively close and is it something that you might consider doing? Let me know your thoughts and ideas on this. Hi Julian, thanks for your email. I’ve painted Trufig outlets as oak before, but I’m based in New York City. 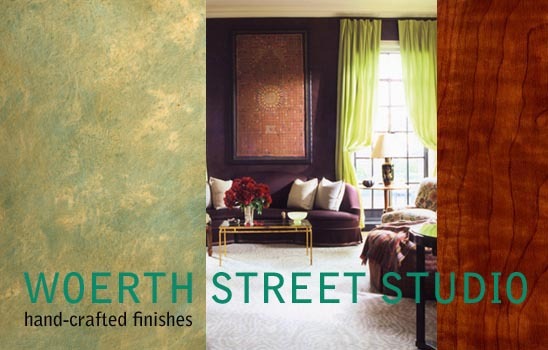 You can probably find a local faux painter who can help you if you google for painted woodgrain or trompe l’oeil.